Beautifully engraved SPECIMEN certificate from the Comshare dated 1978. This historic document was printed by the Security-Columbian Banknote Company and has an underprint of the company logo. This item has the printed signatures of the Company’s President and Secretary and is over 38 years old. Comshare develops and supports e-Business solutions for Management Planning and Control (MPC). 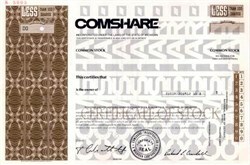 Founded in the United States in 1966, Comshare has grown into one of the world's leading independent software companies. Customers range from mid-sized companies to diversified global enterprises, many of them Fortune 500 and Financial Times 1000 companies. Comshare products and services are marketed through direct sales operations in the U.S., United Kingdom, and Canada, and by a network of resellers and distributors in over 35 countries worldwide.